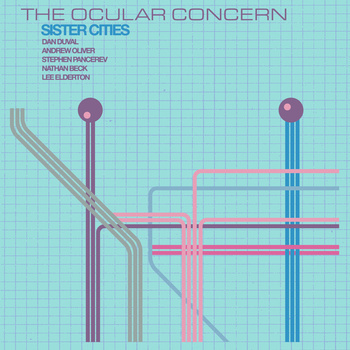 We’re excited for our first release of 2014, “Sister Cities” from the Ocular Concern, a long-standing project of PJCE Records co-founders Andrew Oliver and Dan Duval. The album’s centerpiece is a four-movement suite for the quintet plus string trio and bandoneon inspired by the globalized world of the 21st century and based on the names of Portland’s sister cities worldwide. The album features the group’s wide ranging stylistic aesthetic, tied together by an emphasis on strong interlocking grooves, catchy melodies, and intuitive group interplay. The four-movement suite adds violin, viola, cello and bandoneon, the traditional Argentine tango accordion to the existing instrumentation of Lee Elderton on clarinet, Andrew Oliver on electric piano, Dan Duval on electric guitar, Nathan Beck on vibes and mbira (Zimbabwean thumb piano), and Stephen Pancerev on drums. Though the instrumentation at first glance may seem intentionally bizarre, the nonet blends diverse timbres and styles into a soundscape perfectly suited to Duval and Oliver’s wide reaching compositional aesthetic. The suite opens with “Sister Cities,” a gospel-tinged tune leading to “Portland in Reverse,” featuring the strings in a reflective chamber mood before the introduciton of a Senegalese-inspired beat. “Ghost Town City Council” brings in a western twang and creepy atonal use of the mbira before resolving into the “Island Milonga” with a catchy tango feel to round it out. The other tracks in the album feature the quintet exploring a variety of grooves from the contemporary odd meters of “The Ocular Concern” and “The Eclectic Piano” to a more Zimbabwean-styled trancey beat of “Lafayette” and the serene, chorale-like “William S. Burroughs, LET’S GO!” Throughout, Stephen Pancerev’s intuitive drumming and the interlocking blend of guitar, keyboard, and vibes lays a strong framework for strong and catchy melodic statments, minimalist textures, and Lee Elderton’s spontaneous and brilliant clarinet improvisations.